EXCLUSIVE: Labour’s Barry Gardiner suggested the party should back May’s final Brexit deal, even if they don’t agree with it. Gardiner warned a meeting in Brussels last week that Britain will crash out of the European Union with no deal if either Westminster or European Parliament rejects the final deal. Labour’s official policy is to reject any deal which doesn’t pass its six Brexit tests. Shadow Brexit Secretary, Sir Keir Starmer, will today call for Parliament to decide what happens if the deal is rejected. LONDON – Labour should vote for whatever Brexit deal is negotiated by Theresa May, or risk crashing out of the EU without a deal, a senior member of Jeremy Corbyn’s Brexit team has suggested. 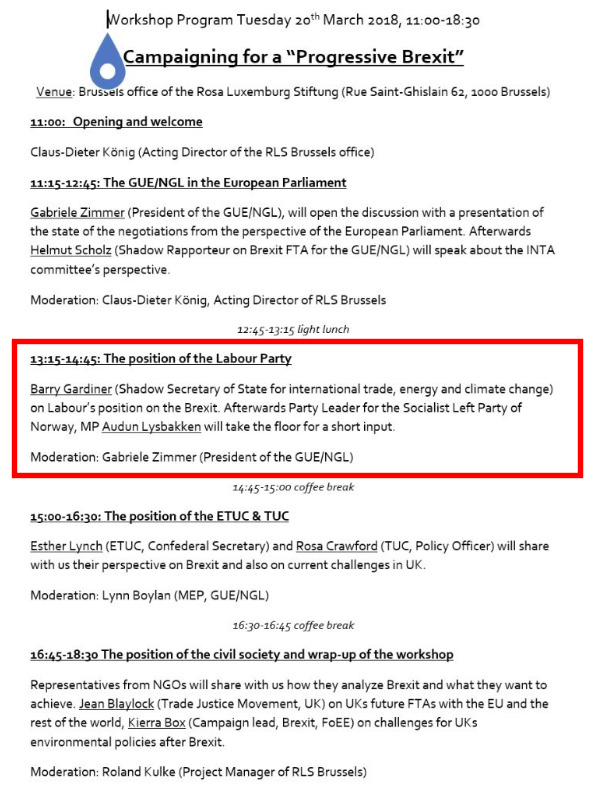 Labour’s Shadow International Trade Secretary Barry Gardiner told an invite-only event hosted by German political institute Rosa Luxemburg Stiftung that politicians should think twice before rejecting May’s deal, even if it contains elements the party disagrees with. At the event which took place in Brussels on Tuesday, Gardiner was asked about the prospect of the withdrawal agreement being rejected by parliamentarians in Westminster or the European Parliament. In response, the Labour MP said: “Let’s look at the consequence of there being no deal. The UK will crash out of the EU,” according to a transcript of the event obtained by Business Insider and confirmed by attendees. Gardiner’s suggestion that May’s deal should be approved, even if parliamentarians disagree with it, is a break from Labour’s official policy, which is to reject any Brexit deal which doesn’t pass the six “tests” unveiled by Shadow Brexit Secretary, Sir Keir Starmer, last year. It comes as Starmer prepares to deliver a speech on Monday in which he is set to say Parliament should decide what happens if MPs vote down May’s Brexit deal. “Our amendment would make it clear that, should the Prime Minister’s deal be defeated, it must be for Parliament to say what happens next, not the Executive,” he is expected to say in Birmingham. “A statutory provision requiring the Government to proceed on terms agreed by Parliament, not on the terms dictated by the Prime Minister. Gardiner’s remarks come after Brexit minister, Lord Callanan,last week told the House of Lords that Britain would leave the EU with no deal if the Westminster Parliament doesn’t approve May’s deal. The Labour Party has refused to comment but Gardiner tweeted on Monday night: “I caution MEPs voting against a deal that may be more favourable to U.K. than they would like.” BI has asked him for further comment. A source close to the leadership said yesterday that Gardiner merely been reflecting the party’s official policy that a no-deal Brexit would be the worst possible outcome from negotiations. Turns EU parliament that I spoke of into U.K. parliament. I caution MEPs voting against a deal that may be more favourable to U.K. than they would like. Payne turns it into my saying U.K. MPs should vote for a Tory Brexit. She added: “The government has been peddling ‘Brexit by Blackmail’ ever since the beginning of the negotiations, and the Labour Party mustn’t fall for it.